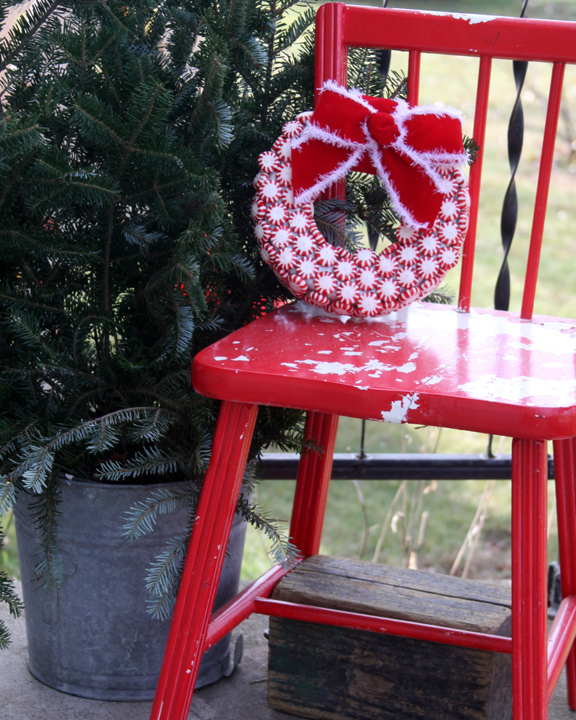 A welcoming wreath at your front door is a great way to greet your guests all year round. During the holidays I love to make fun and festive wreaths to adorn our front door. Peppermint candies hold a special place in my heart and this little peppermint wreath is the perfect Holiday wreath for our home. 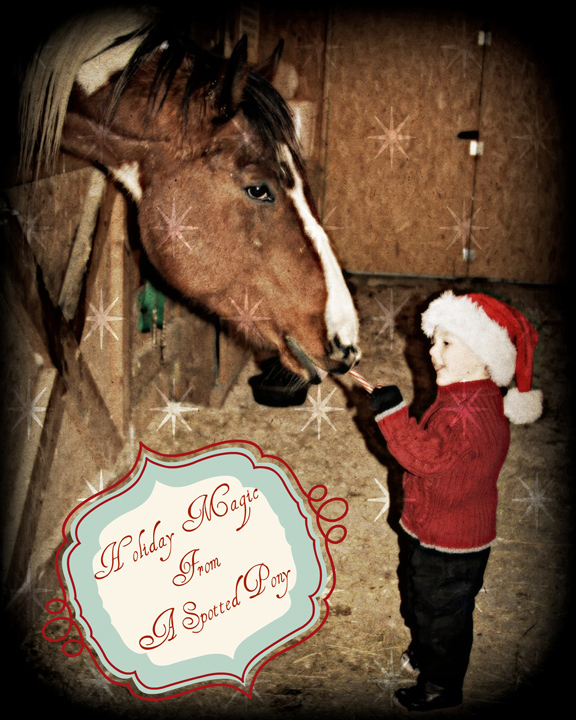 My spotted “pony” Toby adores peppermint candies. For 13 years I have been stashing the little red and white swirled candies in the pockets of my barn coats. Just the crinkle of the wrapper sends him frantically searching for his favorite treat. 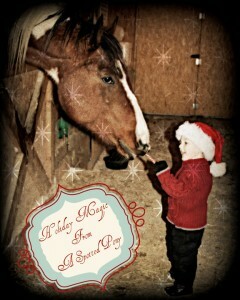 With a peppermint candy I can get that sweet 1,300 pound horse to do just about anything. When I spotted this project on Pinterest, I knew that I had to have one. 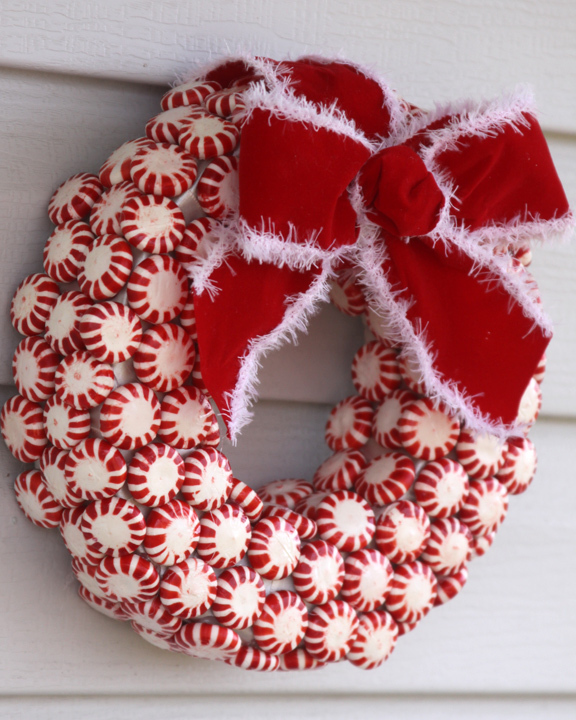 Luckily I had a 5 lb bag of peppermint candies and everything else I would need to throw together this cute little wreath. The tutorial for this wreath came from Gwynn Wasson Designs where she has all sorts of cute candy wreath ideas. I followed her wonderful tutorial, but made a few changes. First off i didn’t want the wreath to be quite so big. I had an 8 inch wreath form at home that I had gotten earlier from the dollar store that I used. It was the perfect size for our door when it was all finished. I also used white ribbon in the background instead of red because I had a roll or two of it left from another project. The red and white felted Christmas ribbon was left over from a family Christmas photo shoot last year. Basically you just wrap the wreath form with ribbon, and glue it on as you go. 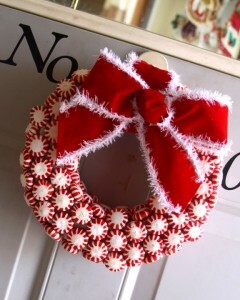 Then you glue the candies around your ribbon covered wreath. Add a pretty bow, and a wire on the back to hang. I also suggest spraying the wreath with some kind of protective coating to avoid the candies melting or running in direct sunlight. 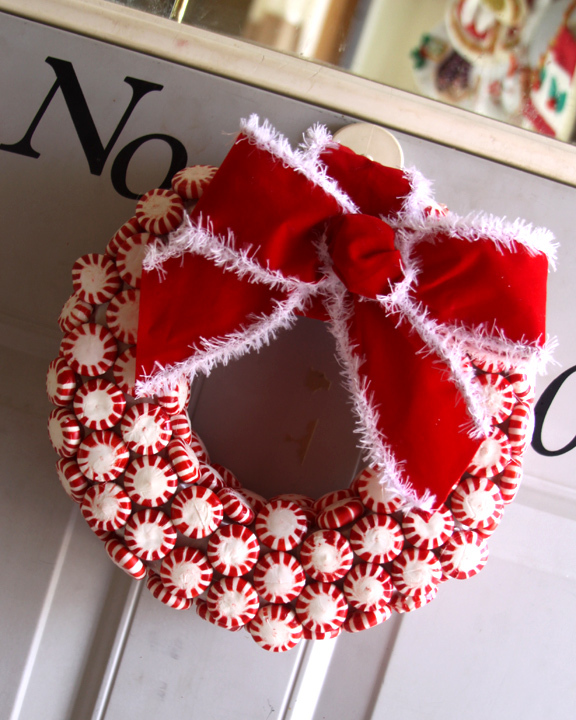 This sweet little wreath only took me one nap time time create, and it makes me smile every time I come to the door. Any kid that comes through the door has to touch it an ask if they can have one too. They don’t understand why I would glue them to a wreath and not eat them. Cute, simple, and so sweet. If ever my spotted pony escapes from his pasture I have a feeling my little wreath would be in serious jeopardy. I can just see him standing with too hooves on the porch step and reaching his long next to the door, nose stretched as far as it could possibly be, and eating this wreath to his hearts content. Ooo…I think I might have to try this! Right now I’m making a starburst shaped wreath out of sticks and it’s so much fun! My stick wreath is a lot of work though, so I feel like I might want to hand it inside instead of on the door so I can enjoy it more. This one sounds faster and I think the red and white would be great on our green front door! You should – it would look marvelous on your green door!! You could even go with the bigger sized one! Mine had to go under the glass window on the door so I made a mini version! Can’t wait to see your twig wreath! I’m sure it will be well worth the effort! What do you think it should be coated with to keep it from melting? I use an indoor/outdoor spray on lacquer spray. You can find it by the spray paints any protective top enamel should work!